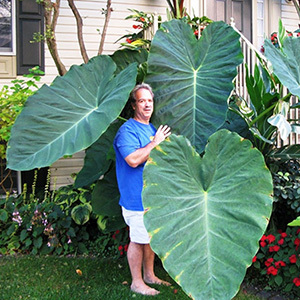 There is a plant with huge beautiful leaves, almost as large as a grown-up person..
We are talking about the; Elephant Ear! The Elephant Ear or Colocasia is known for his tropical look and outrageous foliage. For more information about this extraordinary plant, keep reading.. 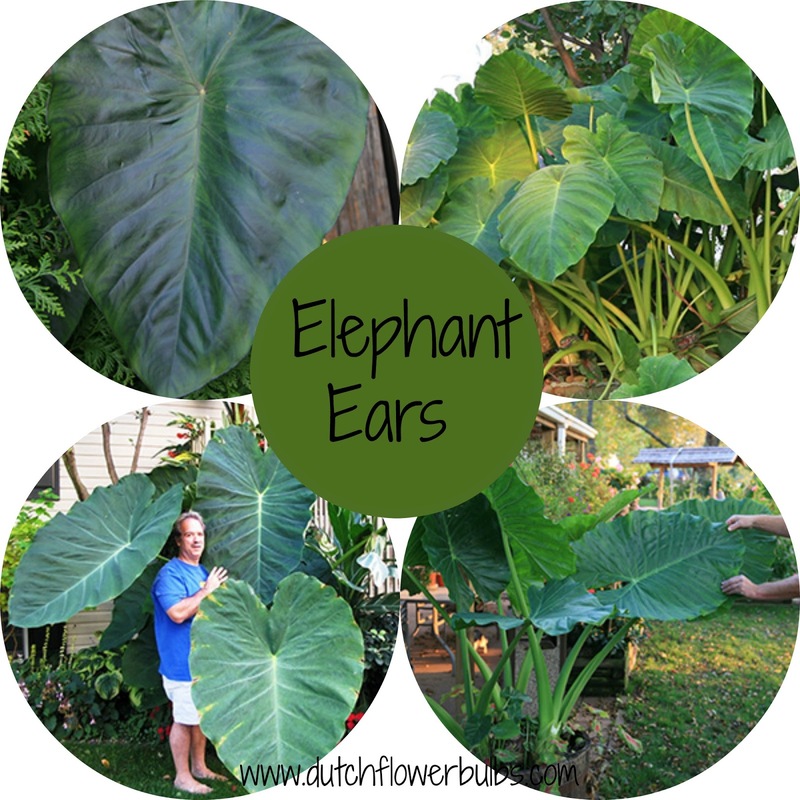 Elephant Ears are tropical plants and originally from Costa Rica. They have large heart-shaped leaves and the colors may be anywhere from green or purplish black. These impressive plants can be grown outside in sheltered locations in zones 8-11. In full sun, but they prefer partial shade. Plant them as soon as the chance of frost is gone. In chillier zones it must be dug up before the winter is coming in. Be careful with the roots, any damage may result in the bulb rotting during the winter. 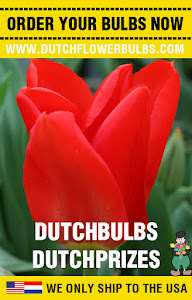 Clean the bulb from dirt and cut of the remaining foliage. Store them in a dark, dry and cool place. Wrap them in paper and check back every two weeks if it has no pests or is rotten. The next Spring you can put them back outside, when all the danger of frost has passed. You may water the tubers more regularly when it is dry and warm outside especially the ones planted in containers. You may also want to apply a slow release fertilizer to the soil once a while. If you prefer to keep them indoors, there are a few things you have to keep in mind. Firstable choose a large container for the plant. Elephant Ears can be huge, so be prepared of this. Decide where you want the Elephant Ears in your room because of the wideness. Don't place them in direct sunlight. They tolerate direct sunlight, but it will eventually cause sunburn. Growing them insides requires a very high humidity, so that is why you'll need a humidifier in the room where you planned your Elephant Ears inside. Plant your Elephant Ear in well-drained and peat-rich soil.